It shouldn’t happen to “man’s best friend,” but it does. Take a drive down many country roads and city streets, and you’ll see them – dogs left to spend their entire lives in “solitary confinement,” trapped at the end of a chain or in a small pen. We can’t think of a crueler punishment for these social pack animals who want – and deserve – companionship, scratches behind the ears, walks around the block, and the opportunity to curl up at their guardians’ feet at night indoors. Kept “out of sight, out of mind” in the back yard, chained dogs are often deprived of adequate food, water, and veterinary care – in addition to having their emotional and social needs completely ignored. Many are denied proper shelter and have nothing but an overturned trash bin or plastic barrel – or nothing at all – to shield them on freezing winter nights. Countless chained dogs have frozen to death during cold snaps or died of heatstroke on sweltering summer days. 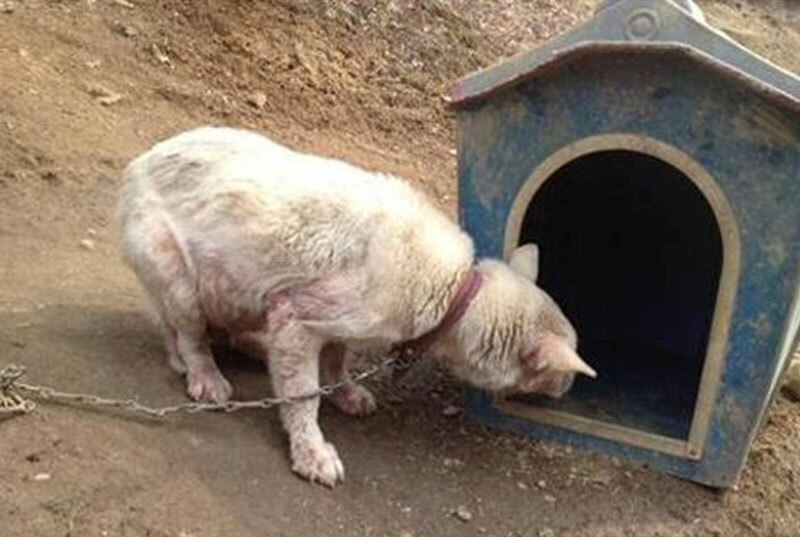 Chained dogs are also totally vulnerable to other animals and cruel people, and many chained dogs have been stolen, set on fire, shot, stabbed, tortured, or poisoned by cruel passersby or neighbors who were annoyed by their barking. Given these cruel living conditions, it’s no surprise that chained dogs often become aggressive and attack children or other people who approach them. Chained dogs are more likely to bite because they are usually unsocialized; their living space is reduced to a few square feet, which heightens their territoriality; and they don’t have the option of escaping during a confrontation. Many communities across America and beyond have learned the hard way that not only is chaining dogs an animal welfare issue, it’s also a public safety hazard. The most effective way to help hundreds or thousands of neglected dogs in your area – as well as prevent dog attacks – is to work with city or county legislators to ban chaining. You may be dogs’ only hope for a shot at a better life.